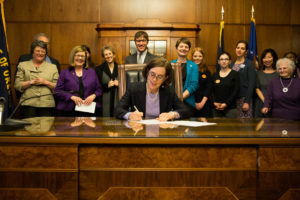 In 2015, Common Cause and a broad coalition of community organizations achieved a major advance to Oregon’s election system with passage of landmark legislation to modernize voter registration. This “New Motor Voter” reform, championed by Gov. Brown, pioneers a path toward universal suffrage, dramatically cutting the number of eligible voters who end up unable to vote. Through this reform, Oregon’s Department of Motor Vehicles, a government agency that interacts with a vast number of Oregonians, helps ensure the security, accuracy, and inclusiveness of Oregon’s voter registration rolls, Anyone eligible to vote who gets or renews a driver’s license or updates their contact information with the DMV is flagged for the Elections Division so that they are automatically registered to vote with the opportunity to opt out, or their contact information is verified and corrected, as needed. Now the reform is spreading like wildfire across the country. And we can expand on it here in Oregon, engaging other qualifying public agencies.